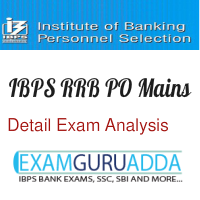 IBPS RRB PO Mains 11 December -Shift-1 Detailed Exam Analysis -IBPS Conduct IBPS RRB PO Mains Exam at various centres all over the country. We are presenting Exam Analysis of Today's IBPS RRB PO Exam held on 11th December 2016 based on Students Feedback. Online exam consist of 200 questions with a time of 120 minutes. Exam consists of sections - Reasoning, Quantitaive Aptitude, general awareness, English/Hindi and Computers. Hindi was easy as compare to other sections.